U.S. Department of Homeland Security Secretary Kirstjen Nielsen was in the St. Louis area on Monday. 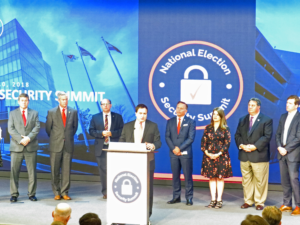 Neilsen spoke at the Election Security Summit being held at World Wide Technology in Marylands Heights. “Any attempt to interfere with our election, successful or unsuccessful is a direct attack on our democracy.” said Neilsen. Missouri Republican Secretary of State Jay Ashcroft is joining a bipartisan group of 25 Secretaries of State and other election officials from across the country for the two-day summit.